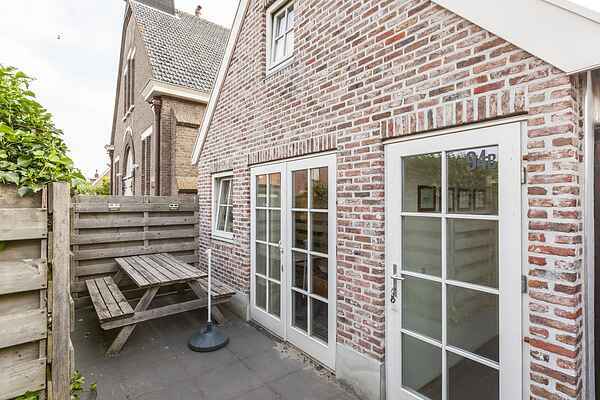 In the harbor village Wemeldinge located on the Oosterschelde is this cozy cottage that is decorated with great taste. Goes (10 km), Middelburg & Vlissingen (25 km) are definitely worth a visit. The cozy cottage has on the ground floor a beautifully decorated living room with TV (cable), a radio and CD player, central heating, free internet and a high chair (on request). The practical kitchen is equipped with, among other things, a coffee machine, a microwave, a 4-burner stove and cooker hood, a refrigerator, a toaster, an electric kettle.With a spiral staircase you enter the first floor where you will find 2 bedrooms. The 1st bedroom has a double bed and the 2nd bedroom has 2 single beds. On the ground floor, next to the kitchen is the bathroom with a shower, a sink and a toilet. Around the house there is a paved, fenced and furnished terrace at your disposal. Extras: The cottage has a washing machine in the kitchen where you can be used. Pets are allowed in consultation. Bed, bath and kitchen linen are included. The house is accessible via a footpath, you can load, unload and park at 50 meters.